Daytona Beach is known as “The World’s Most Famous Beach”. Your friends and family will love the sandy, white beaches that line the Atlantic Coast. In designated areas of the beach from sunrise to sunset, cars are permitted to drive on the beach! Aside from its beautiful beaches, Daytona may be most well-known for the Daytona International Speedway. Today, the Daytona Beach area entertains nearly 8 million influential visitors each year! In addition to the Daytona 500, the Speedway hosts several events throughout the year, including Turkey Rod Run, a four-day event over Thanksgiving weekend featuring classic cars of all makes and models. Although the Speedway is enough to draw visitors from all over, Daytona Beach has also become well-known for its other events such as Bike Week and Biketoberfest. Join thousands of riders as they roar into Daytona Beach for a week of sun, beaches, entertainment and bikes, bikes, bikes!! Popular annual activities include motorcycle shows and rallies, live music, motorcycle racing at Daytona International Speedway, scenic rides, the newest models from top manufacturers and plenty of people watching all across the county. If you enjoy riding, the coastline and “the loop” are among favorites for a great riding experience. Another unique, historic attraction in Daytona Beach is the Daytona Beach Bandshell and Oceanfront Park Complex. This scenic amphitheater, home to the National Cheerleaders Association and Summer Concert Series, is located in Oceanfront Park on the north end of the Boardwalk amusement area and overlooks the ocean. Built of coquina in 1937, the Bandshell seats 5,000 people for concerts, outdoor weddings and receptions, events or convention activities. For more information about the history of the Daytona Beach area, be sure to visit the Halifax Historical Museum located in downtown Daytona Beach. The Museum offers a research facility with old city directories, documents and maps as well as an extensive photographic and postcard collection. Housed in the former 1910 Merchants Bank building, the two-story interior walls are graced with hand-painted murals depicting area scenes, and highlighted by Beaux Arts styling of stained glass windows and lighting. Influential visitors have been flocking to the Greater Daytona Beach area for centuries, and their contributions live on for all to enjoy. During his 1513 search for the Fountain of Youth, famous explorer Ponce de Leon discovered the now-popular DeLeon Springs, located just west of Daytona Beach. It’s one of the many beautiful parks in the area that locals love to visit to cool off during the warm summer season. Whatever the purported health benefits, the springs were indeed a natural wonder. DeLeon Springs is a place for healthful outdoor recreation in a beautiful, natural setting. A unique experience is found at the Old Spanish Sugar Mill and Griddle House located in the park. Florida offers a wide variety of state parks to choose from that are fun for the whole family! DeLand, located in Volusia County, is one of the state’s small town treasures. DeLand is the county seat as well as a college town, with Stetson University’s campus classified as a National Historic District. The downtown, lined with notable gift shops and restaurants, has been recognized as a national Mainstreet program. Special events focus on culture and the arts, history, hospitality and lifestyle. Famous philanthropist John D. Rockefeller discovered Ormond Beach’s immaculate golf courses and made his winter home at The Casements. The Casements, named for the large hand-cut casement windows that adorn the mansion, has been beautifully restored to function as the Cultural Center for the city. Set on the shore of the Halifax River, and just two blocks from the Atlantic Ocean, the late John D. Rockefeller’s winter home is known as “The Jewel of Ormond Beach.” Later, Rockefeller discovered Ormond Beach’s immaculate golf courses and made his winter home at The Casements. Automobile racing became a regular pastime along the hard-packed beaches at the turn of the 20th Century. Ormond Beach became known as the “birthplace of speed” due to the various landspeed records set on Ormond Beach. Visitors come from around the world to relax and recreate on one of the most beautiful, family-friendly beaches in Florida. 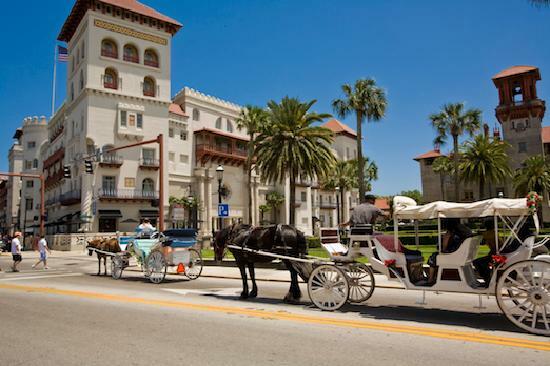 Just 40 miles north of Daytona Beach along Florida’s Historic Coast, history comes alive in red-brick lanes leading to centuries-old churches, in forts where soldiers still walk the grounds, and on horse-drawn carriage rides through time. Head just out of town and back to nature along 42 miles of pristine Atlantic beaches. Bring your clubs and hit the links – numerous championship golf courses await. Or get caught up in the area’s timeless romance. Featuring, restaurants, beaches, shopping, history, arts and culture, St. Augustine will become one of your favorite places to visit. 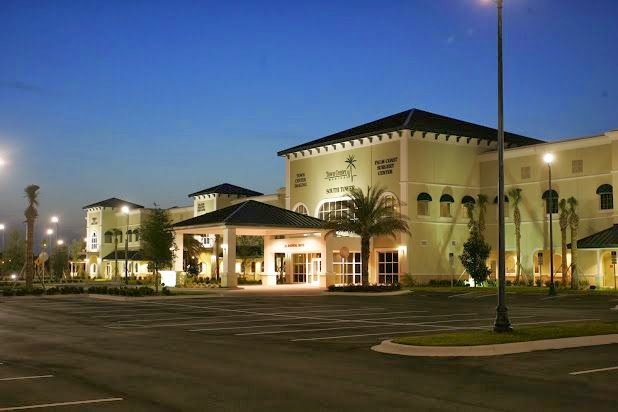 Less than an hour from the Daytona area is a favorite Central Florida vacation destination. Orlando is beloved for its theme parks, water parks, shopping malls and dining. The city is also sometimes nicknamed “The Theme Park Capital of the World”, as it is best known for the Walt Disney World Resort , founded by the Walt Disney Company in 1971, the Universal Orlando Resort (which consists of two parks, Universal Studios Florida and Islands of Adventure, as well as other attractions, including City Walk), SeaWorld, Gatorland, and Wet ‘n Wild Water Park. With the exception of Walt Disney World, most major attractions are located along International Drive. The city’s famous attractions form the backbone of Orlando’s tourism industry, making the city the most visited American city in 2009. The city is also one of the busiest American cities for conferences and conventions. Orlando attracts over 51 million tourists a year (3.6 million of them are international tourists). Its airport, the Orlando International Airport (MCO), is the thirteenth busiest airport in the United States, and the 29th busiest in the world.